All through our lives the enemy will try to distract us from God’s best for us. The devil is a liar and he is very good at giving you a counterfeit. A presentation that is close enough, just so you don’t get to perfect will of God. To overcome we have to know the truth so that when the lie is presented recognise it. ‭‭At times l can be a little impatient. As l was working through what to write about today God took me to the above verses ☝🏽. As l began to seek for understanding, l realised that in my current season l was beginning to get blinded of the will of God for me. The illustration given in EPHESIANS‬ ‭5:18 of drunkeness is exactly what we become when we are not led by the spirit. To grasp the will of God we have to be constantly led by the spirit.. Our adversary the devil deceives us when we are led by our emotions, by our circumstances, by worldly goals and times deadlines. Being a child of God, trying to live according to his will, l am constantly bormbaded with perception, opinions and questions. And l recognised that if l am not vigilant l will settle for counterfeit blessings. Recognise and understand the will of God for your life. Know the truth about what God says and the promises He has for you. 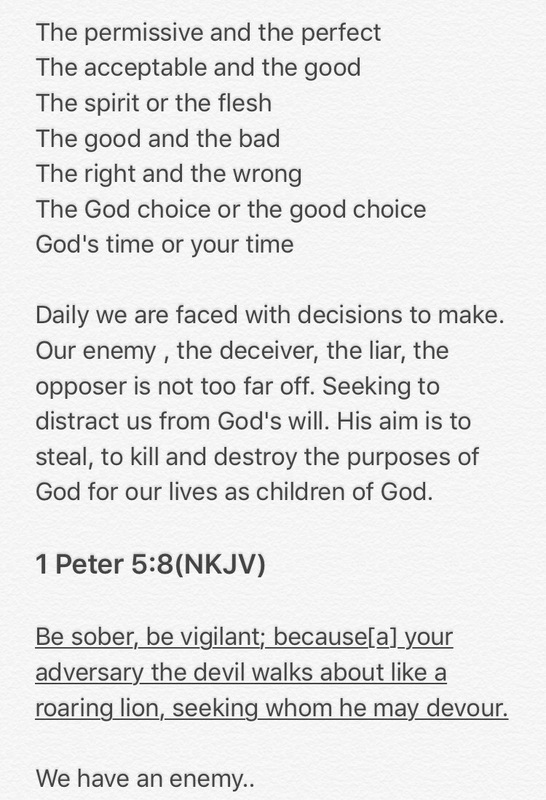 Be vigilant and know that you have an enemy. Don’t settle for something God hasn’t confirmed for you.